Rayman Origins surprised a lot of folks last year with how charming and sharp its presentation and gameplay was. The product of Michel Ancel's Ubi Montpelier studio felt like a playable animated cartoon, mostly because a very cool game engine let the dev team easily and quickly pull drawings into a game design. Origins was a bit under-appreciated but held in very high regard by those who played it. 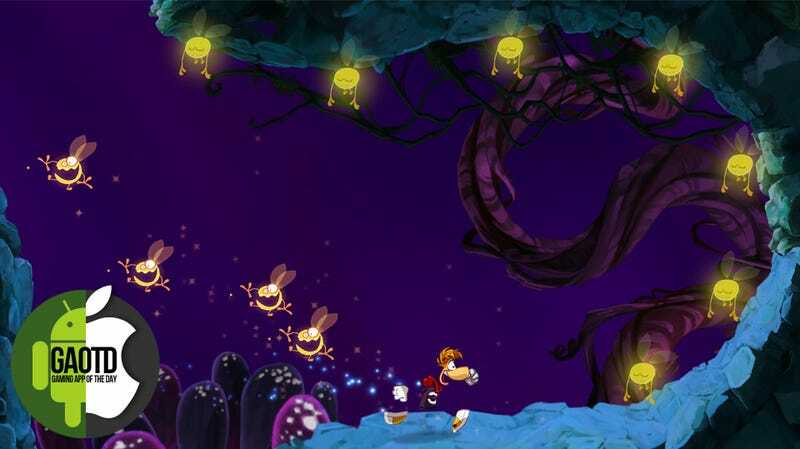 So, when publisher Ubisoft announced that a mobile offshoot of Rayman would be hitting devices this fall, there was a mix of dread and optimism at how that transition would go. Devriez-Vous Acheter Rayman: Origins? Oui. Now that I've played Rayman Jungle Run, I'm happy to report that fans of the limbless hero can ditch the dread and leap recklessly into optimism. This is an inventive re-working of a great game, one that's skillfully pared down yet preserves the appeal of its source iteration. First off, Jungle Run looks as wonderful on an iPad as its console relation did on an HDTV. The energetic animations of the characters and world come through almost untouched, benefitting from a bright, beautiful palette. Christophe Heral's marvelous music from Origins gets repurposed here and Jungle Run gets lots of zip from one of 2011's best soundtracks. Jungle Run comes across as an interesting hybrid of an infinite runner and a traditional platformer. The goal of the game is to collect as many of each level's 100 glowing Lum creatures as quickly as you can, in four worlds organized by the abilities you'll wield, namely Jump, Wall Run, Fly and Punch. There are nine levels in each stage and perfect runs in those levels— where you nab all 100 Lums—unlock gems that open up each world's Land of the Dead, an extra area peppered with fatal spike creatures and bottomless pits. These segments of the game are merciless but not mandatory. Rayman runs automatically and all you really need to worry about is timing his jumps just right. That's trickier than you might think. The levels are structured like little mazes, peppered with nooks and side paths that you can miss if you jump when you shouldn't or don't jump at the right time. You can re-direct your momentum in clever ways depending on what environmental elements are in your path. Some floating tethers let you swing back and forth and other only let you push forward. You always need to be aware of what's ahead of you and that there might be spaces above, below and even behind you that hold more precious Lums. Simply put, Jungle Run is a version of Origins that works on the touchscreen. A small sidenote: I was overjoyed to not see any microtransaction prompts in Rayman Jungle Run. They just want folks to pay once and have a good time playing through. And it's a pretty good time. Jungle Run feels like its predecessor, but reconfigured in a way best experienced on a new platform. This Rayman title still homes in on the core skills you use when playing platformers—spatial perception and reflexes—but plays out in a way that you won't miss the buttons or analog sticks. Imagine that.